Visual poetics in new media design is a dynamic form of communication that integrates diverse media into poetic statements that form a new type of hybrid literacy. Early examples of visual poetics include petroglyphs and other forms of pictorial writing, as well as the pattern poems of Greek poets and Apollinaire. However, contemporary visual poetics now includes works of art and design that are three-dimensional, multimedia, and interactive. This paper includes an historical overview of visual poetry and contemporary new media poetics. The paper also includes an analysis of the complex syntax of this new literacy which includes multimodal semiotics, kinesthetic design, and interactive aesthetics. Examples of art and design ranging from indigenous to contemporary works are included to illustrate these concepts. Understanding the semiotic structure of this complex form of visual literacy will help researchers, educators, artists, designers, and other professional communicators define new ways to use these hybrid designs. Examples of visual poetry can be traced to early forms of communication including petroglyphs, Maya glyphs, Egyptian hieroglyphics, Greek poems, and the illuminated manuscripts of the Middle Ages (Kempton, 2010). The technopaegnia of the Greek poets like Simias and the pattern poems of George Herbert and Guillaume Apollinaire are well-known early forms of visual poetry. These poems, which were formatted in the shapes of images that represented ideas in the poems, added visual structure to poetry. Contemporary visual poetry includes two-dimensional and three-dimensional works, as well as interactive media design and performance art. Space, time, and action add layers of meaning to the audiovisual syntax. The discursive and polysemiotic dimensions of these works challenge the viewer to make dynamic connections between the linguistic, visual, and audio elements. These cross-modal forms of visual poetry require a cognitive interpretation of text, as well as an understanding of multimodal semiotics, kinesthetic design, metasyntax, and interactive aesthetics. This paper includes a discussion of each of these dimensions of visual poetry using examples ranging from indigenous art to contemporary work. It also includes a detailed analysis of an interactive installation titled Beyond Time which incorporates all these design elements. Each medium in multimedia computing has a specific semiotic structure. Visual information, language, and sound communicate cognitive and sensory information in different ways. Images, sound, and text contribute to the semiotic structure of visual poetry. Each medium can expand the meaning of the work and create layers of associations that complement each other, as well as create cognitive or perceptual dissonance. Visual images are spatial and “all-inclusive.” Images create spatial depth with color, line, form, transparency, and perspective. Layers of meaning are defined by perceptual relationships that are defined by Gestalt laws of similarity, closure, proximity, and figure/ground relationships. Repetition and rhythm integrate space and time into a flexible format that encourages diverse viewer interpretations. Agular (1990) noted that “images have a major communicative power because of their intensity, their implicit and explicit movement; the texture, color, and force of forms; the vibration which we feel on seeing them; and above all the instantaneity of reading” (p. 91). Indigenous paintings, weavings, and pottery are excellent examples of visual poetry where lyrical lines and forms, color, rhythm, and figure/ground relationships define strong spatiotemporal languages. Contemporary indigenous artists continue the traditional art forms of their ancestors using visual languages and symbolic narratives to define their heritage, relationships to the environment and spiritual worlds, and a sense of place over time. Northwest Coast Indian art, for example, weaves lines and forms together into lyrical, spatial relationships that define layers of rhythm and diverse planes using positive and negative space. Robert Davidson’s work highlights the visual poetics of this art form (http://www.robertdavidson.ca/new_works.php?main=1). Holm (1965) conducted a thorough analysis of the visual elements in this art and discovered overarching rules behind the forms, lines, colors, and negative/positive spatial relationships that define a visual and poetic language (see examples in “Formline: An Evolving Art by Bill Holm”). This visual language adds another layer of meaning to the creation and ancestral stories represented by the images of birds, fish, and animals that are integral to their legends and culture. The granularity of audiovisual spatial representation ranges from specific or localized representation, which is achieved with graphics, to infinite or non-localized space, which is achieved with sound (Search, 2002). Audio can be both linear and spatial. Melodic sequences are linear, but sounds can also penetrate space and define psychological relationships with the surrounding environment. In addition, melodies, chords, harmonic progressions, modulation, tonality/atonality, rhythm, accent, synchronicity, and dissonance define patterns and layers of sound that create structured, yet flexible, multidimensional expressions of space and time. 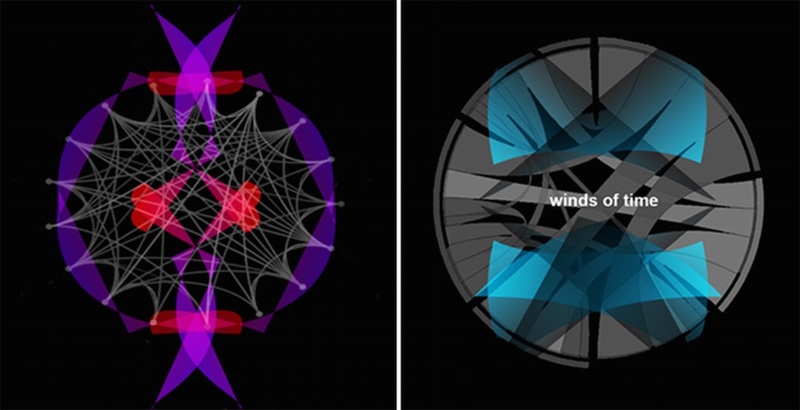 These audio elements are demonstrated in an art installation titled Sound Forest which was created by Minori Nagashima, Hideyuki Nakazato, Sho Kamuro, Kouta Minamizawa, and Susumu Tachi from the Graduate School of Media Design at Keio University in Japan. Linear progressions, rhythm, modulation, dissonance, and ambient sounds define multiple layers of spatial depth and structure over time. The audio experience is enhanced by visual sculptures that define physical locations in space and allow participants to experience a haptic sense of sound when they touch the sculptures (www.youtube.com/watch?v=fZRBgIUC4lg). Text adds another spatiotemporal dimension to visual poetry with its linear, sequential syntax. Tuan (1997) points out that “. . . language is better suited to the narration of events than to the depiction of simultaneous spatial relations” (p. 77). However, the discrete nature of text takes on a level of indeterminacy in many forms of visual poetry, especially interactive visual poetry where the words, images, and semiotic relationships on the computer screen continually change as the viewer navigates through the interactive program. Kay Rosen works with the changing semantic structure of text. She integrates large letters and words into physical spaces where the meaning of the text takes on multiple layers of meaning and expands beyond text to various types of iconic symbolism. In the installation titled Blurred (2004/2007), the word BLURRED is displayed as very large text that wraps around an inside corner of the room. The first part of the word, BLUR, is blue; the rest of the word, RED, is red. In another work titled Leak, the word FLOOR appears along the bottom of a wall. Directly above, near a ceiling skylight, the word ROO F (1997) appears—upside down and with a space between the “O” and “F.” Her work includes humor and insight into the way we use language to define spaces, events, and actions. Synesthesia is another dimension of multimedia art and design that occurs when elements from one of the senses trigger sensory responses from another sense. For example, a visual element may use color or texture to suggest specific tactile or aural responses, or sound may evoke visual images, resulting in cross-modal experiences that impact the perception of place and time. Many artists have used synesthesia to add multisensory dimensions to their works. Wassily Kandinsky used color, line, and form in his paintings to suggest sounds and music. Doris Salcedo uses furniture and other everyday objects to create visual and tactile works that comment on the oppression in third world countries, in particular her native Columbia (Public Broadcasting Service, 2009). In a series of three poetic sculptures titled Unland (1998), hair and raw silk fibers were sewn into wooden structures that were constructed by combining old tables. The tactile quality of her work conjures up many images and human qualities, including the fragility of human life. Some visual poems include voiceovers that use tone and inflection to add layers of symbolism to create cognitive and sensory associations. Nina Katchaturian (2005) uses voices and language in the installation titled Accent Elimination to comment on linguistic patterns in foreign accents and highlight the “complexities of assimilation and self-image, and the tricky maneuvering between the desire to preserve the distinctive marks of one’s culture, on one hand, and to decrease them in order to seem less foreign, on the other” (para. 1). In another work titled Surface Spoils: Concrete Music from Europe (1997), Katchaturian spliced discarded audio tapes that she found on the ground in European countries into new audio works which she then transferred to a CD and incorporated into an interactive installation. In audiovisual forms of visual poetry, multimodal semiotics defines a system of relational codes that the viewer must interpret. The different media create multiple levels of perceptual encoding, spatial and temporal relationships, and cognitive associations. Recursive patterns emerge as symbols become interpretations of visual elements, text, and sound. This discursive dialog adds meaning to the temporal transformation of information. Interactive visual poetry integrates physical and virtual spaces, and adds new levels of sensory abstraction to the layers of relational encoding. The senses define multidimensional models that are virtual extensions of the physical world. Rhythm, space, and time are key design elements in multimodal semiotics. Words and letters add rhythmic dimensions to visual poetry through typography, inflection, repetition, alliteration, and pacing (which is defined by punctuation, spaces, word length, alignment, layout, and formatting). In images and graphics, lines, forms, color, and texture add layers of rhythm, as do animations and transitions between elements which define movement through time. Sound and voiceovers bring strong rhythmic elements to visual poetry through tempo, beat, duration of sound, silence, periodicity, repetition, flow, cadence, and synchronization. Rhythm creates an overarching structure for the flexible semiotic codes that characterize visual poetry. For example, the repetition of specific audiovisual rhythms weaves individual elements into a coherent whole (Search, 2012). 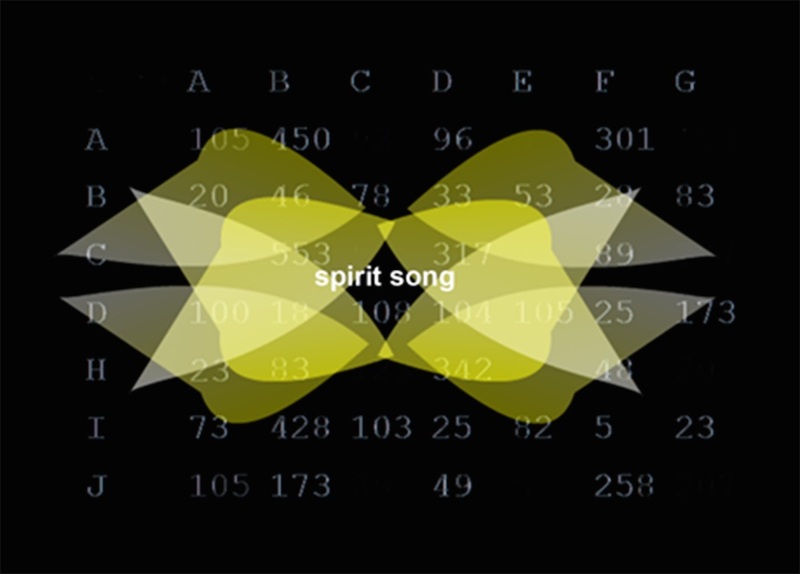 In interactive visual poetry, where audiovisual information continually changes over time, the repetition of audiovisual rhythms, combined with the rhythm of gestures and physical interaction with the hardware, creates an immersive experience that integrates the spatial and temporal dynamics of the interactive poetry (Search, 2012). Elliot Gaines (2010) described the semiotics of space as “a descriptive process enquiring into the relevant significance of sign relations between objects and their spatial contexts” (p. 78). In visual poetry, space is an important component that integrates the audiovisual experience into a cohesive whole and provides structure. Text, images, sound, and movement (in interactive poetry and performance art) create multidimensional arrays of spatiotemporal relationships that define the meaning of the work. In interactive works, these relationships become part of a dynamic, hybrid space that integrates the virtual and physical worlds (Search, 2008). Negative space in visual images and silence in music and sound also play important roles in visual poetry because they create pauses that provide opportunities for the viewer to fill in information and form connections between ideas. Space takes on symbolic significance as the “place” where the transformation of ideas occurs. Stéphane Mallarmé was one of the first visual poets to use negative space on the printed page to create unique spatial structures in visual poetry. In his experimental poem Un Coup de Dés Jamais N’Abolira Le Hasard (A Throw of the Dice will Never Abolish Chance), typography and layout create visual landscapes with text and space that challenge the viewer to “read” the pages as layers of visual and linguistic expression. This work paved the way for contemporary book art and graphic design to expand beyond the boundaries of the traditional page layout by using space and time to create new visual and semantic structures. With these forms of visual poetry, the linear structure of the poem is often eliminated, resulting in a web of abstraction derived from randomly constructed networks of individual words and personal interpretations. Padin (1990) noted that the “vehicle of poetry is changed from the linear to the structural, from discursive poetry encased in a sonnet or temporal free verse to the space-time poem-product” (p. 36). He went on to add that this new visual poetry has led to an “omnipresent space” and the “cancellation of time . . . Space is poetry is space is poetry” (p. 37). Julie Chen and Brian Dettmer continue to redefine the book format by expanding it into multiple dimensions that incorporate elaborate spatial structures. Chen’s work unfolds as panels or intricate, puzzle-like boxes (http://www.flyingfishpress.com). Dettmer gives new life to print technology by “carving” books into new shapes and forms that become symbolic references to the content (http://briandettmer.com). Ebon Heath’s work also frees the written word from the constraints of the two-dimensional page and translates it into three-dimensional, multisensory mobiles, jewelry, and performance art (http://www.listeningwithmyeyes.com). In his typographic ballet, dancers’ costumes are shaped from strips of text that form loops and ribbons of typographic design. The dancers move to the sound and rhythm of a poetry reading, musical accompaniment, and dynamic stage lighting that chromatically transforms the visual elements. Layers of audiovisual rhythm create an interactive, multisensory experience that engages the audience in a dialog about the spatial and temporal dimensions of language (Carte Blanche Gallery, 2008, para 2). Space and time are also important design elements in the work of Jenny Holzer, a neo-conceptualist artist who uses text to comment on life in contemporary society. She displays one-line statements, called truisms, with LED lights that move the text through buildings. She also uses projectors to display text on the outside of buildings and surrounding environment (http://projects.jennyholzer.com/projections). The installations create an immersive, spatiotemporal experience for the viewer. Ken Ragsdale uses visual poetry to explore narratives, memory, and time. He examines the fluid nature of memory in unique two- and three-dimensional works that draw on his memory of past experiences. In his installations, we are able to experience another space and time with his engaging and insightful snapshots of past memories. It’s in the Book (2011) is an installation that incorporates text, images, and three-dimensional objects in a schoolroom setting that challenges us to recall our own learning experiences (http://www.kenragsdale.com/installations.html). A large-scale tractor was constructed by folding a one-piece paper diagram. This technique underscores the fact that memories are formed over time, and while they play a prominent role in our lives, they are also fragile and subject to change. Kinesthetic design is found in interactive visual poetry where the viewer’s gestures or physical movements in the interactive experience create perceptual and cognitive connections between the physical and virtual worlds. Interactive designs in mobile devices and many digital games map the actions and movements of participants to actions in the digital world. The parallel movements create a tangible connection between the physical and virtual environments. Actions may also include acceleration and deceleration, forward/backward movements, linear, angular, and circular motions. The speed, direction, and shape of these movements define the rhythm of interaction which adds another dimension to the visual poetics of the interactive designs and performance art. With these new technologies, the gestures and movements of the participants become part of the design and define a spatial grammar of interaction that integrates the audiovisual computer interface with the physical space of the viewer (Search, 2006). Kinesthetic design helps the viewer understand the visual and cognitive relationships defined in the virtual space (Search, 2002). In addition to the specific movements, the space between actions can contribute meaning to an interactive experience and add another dimension to the aesthetics of the work. Djajadiningrat, Matthews, and Stienstra (2007) said this “semantics of motion” shifts action from a purely functional role to an aesthetic role that is “necessary” for envisioning an experience (pp. 10-11). They identified this “choreography of motion” as “the expression or beauty of the movement,” and used the term “arch of tension” from the performing arts to describe how the “expression of the work unfolds” (Djajadiningrat, Matthews, & Stienstra, 2007, p. 31). Gestures and bodily movements also constitute a universal visual language because they are based on shared and tangible experiences. LeBaron and Streeck (2000) pointed out that gestures provide a bridge between tactile experiences and the abstract conceptualization of these experiences. They highlighted the work of the French philosopher Condillac who felt gestures “constituted the original, natural language of humankind” because they formed symbols and a social language based on common experiences (LeBaron & Streeck, 2000, p. 118). Condillac (1746) called these symbols or signs sensations transformées or transformed sensations (p. 61) because they referred to “the entire complex of affect, desire, sensory perception, and motor action that makes up what nowdays we might call ‘embodied experience’ ” (LeBaron & Streeck, 2000, p. 118). In multimedia visual poetry, words, images, sound, and physical movements form an integrated whole. It is not possible to remove an element without completely changing the meaning of the work. As Morris and Swiss (2006) pointed out, “As elements on their own, they may be lacking in poetic capacity, but in relationship with other elements—signs, words, images, computational and performative qualities—a poetics, or signifying harmonics, may emerge” (p. 302). McLuhan (1994) noted that “media as extensions of our senses institute new ratios, not only among our private senses, but among themselves, when they interact among themselves” (p. 177). In multimedia works, a metasyntax emerges that is transmodal (Macken-Horarik, 2004) and transcends the semiotics of individual elements (Search, 2008). The metasyntax integrates the semantic, spatial, and temporal modalities of words, images, sound, and movements into a holistic, multisensory experience (Search, 2013). In interactive forms of visual poetry, these associations change over time as new patterns and audiovisual relationships emerge. Audiovisual aesthetics is complemented by physical interaction that involves gesture and embodiment. Meaning is also derived by interaction with people, the surrounding environments (physical and virtual), and time (Search, 2012). French art critic Bourriaud (1998) felt the criteria we should use to evaluate open-ended art works are the relationships themselves that are produced by the art works, especially the connection the art creates with the viewers which defines the “criteria of co-existence” (p. 109). In interactive digital art and visual poetry, the criteria of co-existence and interactive aesthetics also derive meaning from the representational dichotomies in the physical and virtual spaces that challenge the viewers to define new relationships between reality and fiction using the multimodal semiotics of visual poetry (Search, 2012). The meaning and aesthetics of the work is further defined by the spatial, temporal, and sensory associations that are part of the interactive experience. The author’s multimedia art installations are examples of visual poetry that incorporate multimodal semiotics, kinesthetic design, metasyntax, and interactive aesthetics. The installations use HyperGlyphs to weave a tapestry of space and time with words, images, sound, and actions that define a “spatial grammar” of interaction. HyperGlyphs define multisensory, holistic experiences that represent cognitive and sensory connections with the physical and spiritual worlds. These connections are characterized by fluid relationships and layers of associations that form an integrated whole. In the installations, individuals simultaneously interact with two different computer programs that project layers of visual information and animations onto a white wall. The visual information appears in transparent layers that integrate virtual and physical spaces. The programs include sound, so there are also layers of audio that change as the individuals interact with the programs and modify the visual information. The participants continually redefine spatial and temporal relationships by transforming the different media into complex audiovisual patterns. Rhythm defines dynamic relationships in space and time through sound, form, line, color, language, and audiovisual transitions. 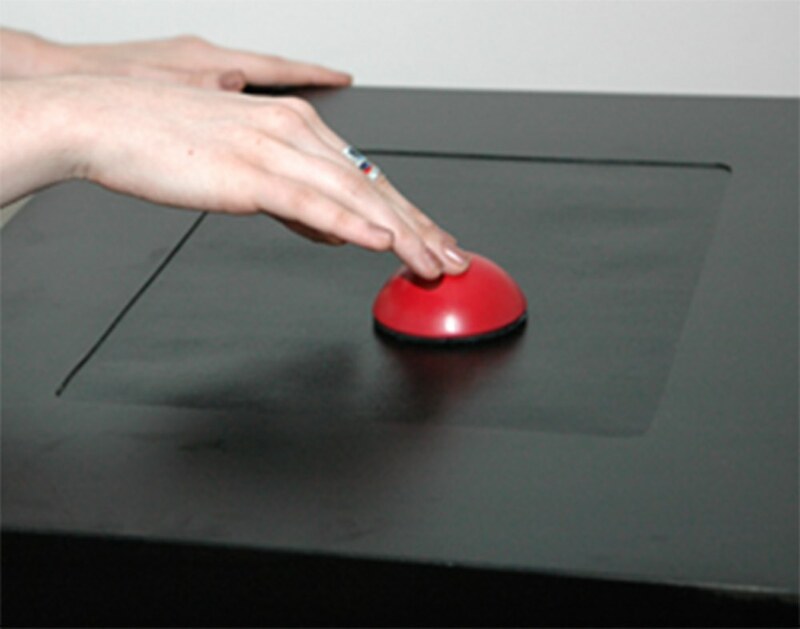 The participants use custom designed hardware, a red spherical mouse, to interact with the programs (Figure 1). The mouse duplicates the color and shape of red spheres the participants move in the virtual space to interact with the elements in the programs. Circular hand and arm movements are required to navigate in the programs, and these movements mirror the circular movement of animated shapes in the virtual space, creating an intricate choreography of motion which integrates the virtual space with the surrounding physical environment. Memory also plays an important role in the installation because information appears and disappears from the computer screen. As the information changes, the participants rely on memory to navigate through the program. They establish perceptual and cognitive landmarks to help them define a sense of place as new patterns and audiovisual relationships emerge. A metasyntax emerges that creates a holistic experience by integrating the semantic, spatial, and temporal modalities of the diverse media and actions. The installation titled Beyond Time (2014) integrates HyperGlyphs with symbols from data visualization, resulting in a new form of visual language. Contemporary scientists demonstrated that scientific data consists of dynamic, multidimensional relationships that are defined by context and how the context changes over space and time (Search, 2014). Beyond Time integrates forms, words, and sounds, inspired by indigenous cultures, with visualizations of scientific data. Figure 1. HyperGlyphs Installation. A special mouse, with a spherical shape, mirrors the shape and color of three-dimensional spheres the participants move in the interactive programs. The installation juxtaposes spatial and temporal relationships, which are defined by intuitive, sensory responses to the environment, with mathematical representations of space and time. The fluid integration of these different conceptual models is symbolized by continuous shapes, animations, rhythmic sounds, and the movements of the participants as they interact with the programs. These layers of symbolism are juxtaposed with numerical data and visual images that represent scientific data (Figure 2). Grayscale images contrast with full color images and symbolize the different types of reality that are inherent in the discrete, mathematical representations of the physical world and the “reality” based on human intuition and sensory perception (Figure 3). Images fade and blend together to signify this integration of different realities. The text in the work is inspired by the songs and chants indigenous peoples use to express their physical and spiritual relationships to the environment. The words and phrases symbolize the continuity of the natural world and the human perception of experiences through space and time. This language is juxtaposed with the mathematical language and visualizations scientists use to express spatial and temporal relationships. Figure 2. Screen from Beyond Time. In this interactive art installation, different realities are represented by the juxtaposition of fluid, organic shapes with numerical data. Copyright 2013 by Patricia Search. All rights reserved. Social interaction also plays an important role in this installation. Participants observe the actions of each other to learn how to alter the visual patterns and navigate through the programs. They often base their moves on the actions of the other participant. As they explore the program, they share insights about the design of the work. They describe the patterns and audiovisual relationships and collaboratively define the meaning of the art. The social interaction becomes a mediated discourse, which incorporates social and cultural traditions into the aesthetic interpretations of the art. In visual poetry, Aragao (1990) noted that “The status of the object of aesthetic knowledge becomes ever more social and difficult to isolate. That which is considered the “essence” renounces the ontological pretension to transform itself in a situation of encounter between people” (p. 83). Figure 3. Screen from Beyond Time. Transparent layers of color and grayscale images fade and blend together to represent the integration of physical and spiritual worlds. Copyright 2013 by Patricia Search. All rights reserved. There are many examples of visual poetry in experimental literary works and fine art. Visual poetry is also an emerging genre in commercial designs, as companies seek innovative ways to attract attention and communicate to the public in a media-saturated market. In addition, mathematicians, scientists, and data analysts are creating another type of visual poetry with multisensory data representation which they are using to explore numerical relationships and transform complex data sets into dynamic patterns that define alternate realities. Artists are also using data representation in creative works that comment on social, cultural, and environmental issues. Like other forms of visual poetry, multisensory data representation includes complex semantic structures that are defined by different types of perceptual encoding. As Steen (1988) pointed out, mathematics is a “science of patterns” with abstract levels of visual encoding in which “theories emerge as patterns of patterns” (p. 616). West (1991) noted that multiple levels of perceptual encoding create a model for describing “those aspects of visual modes of thought that appear to lie beyond the analogy of mere sight” (p. 290). West’s analysis can be applied to all forms of visual poetry and multimedia design that use the sensory and semiotic synergy of different media to generate new insights and perspectives. As various types of visual poetry appear in different areas of communication, new forms of literacy are evolving. Arago (1990) noted that the “real base” of language is changing as “the word emerges compromised and interlinked to the signs of contemporary communication” and “words and images are transfigured by their interaction until they form an ambiguous and enigmatic communication, which rearranges art” (p. 81). The result is a new dimension in visual literacy that uses the power of different media and cross-modal perception to create engaging, multisensory designs for diverse applications and audiences. Agular, R. (1990). Poetry: Or the interaction of signs. In C. Espinosa (Ed. ), Corrosive signs: Essays on experimental poetry (pp. 91-98). (H. Polkinhorn, Trans.). College Park, MD: Maisonneuve Press. Aragao, A. (1990). The writing of sight. In C. Espinosa (Ed. ), Corrosive signs: Essays on experimental poetry (pp. 79-81). (H. Polkinhorn, Trans.). College Park, MD: Maisonneuve Press. Bourriaud, N. (2002). Esthétique relationnelle. Dijon: Les Presses du Réel. Brakhage, Stan (1963). Metaphors on vision. Film Culture. No. 30. Condillac, E. (1746). An essay on the origin of human knowledge, being a supplement to Mr. Locke’s essay on the human understanding. London: J. Noursse. Djajadiningrat, J., Matthews, B., & Stienstra, M. (2007). Easy doesn’t do it: Skill and expression in tangible aesthetics. Personal and Ubiquitous Computing, 11(8), 657-676. Eco, U. (1989). The open work. Cambridge, MA: Harvard University Press. Gaines, E. (2010). Media literacy and semiotics. New York: Palgrave Macmillan. Holm, B. (1965). Northwest Coast Indian art: An analysis of form. Seattle: University of Washington Press. Katchaturian, N. (2005). Accent Elimination. LeBaron, C., & Streeck, J. (2000). Gestures, knowledge, and the world. In D. McNeill (Ed. ), Language and gesture (pp. 118-138). Cambridge: Cambridge University Press. Morris, A., & Swiss, T. (2006). New media poetics: Contexts, technotexts, and theories. Cambridge, MA: The MIT Press. Padin, C. (1990). New poetry III. In C. Espinosa (Ed. ), Corrosive signs: Essays on experimental poetry (pp. 36-38). (H. Polkinhorn, Trans.). College Park, MD: Maisonneuve Press. Public Broadcasting Service (2009). Art in the twenty-first century, Season 5. Search, P. (2006). The spatial grammar of interaction design: Weaving a tapestry of space and time in multimedia computing. In R. Griffin, B. Cowden, & M. Avgerinou (Eds. ), Animating the mind’s eye (pp. 185-190). Loretto, PA: International Visual Literacy Association. Search, P. (2008). The dynamic aesthetics of experience design. In K. Bordens (Ed. ), Proceedings of the International Association of Empirical Aesthetics Congress. Chicago: International Association of Empirical Aesthetics (IAEA). Search, P. (2012). Relational aesthetics in interactive art and design. In J. Chen (Ed. ), Aesthetics@Media, Arts & Culture (pp. 632-643), Taipei, Taiwan. Search, P. (2013). The design syntax of interactive multimedia computing. In L. Fadel, C. Spinillo, M. Moura, & R. Triska (Eds. ), Selected readings of the 5th Information Design Conference: Research and practice (pp. 47-54). Florianópolis, Brazil: Brazilian Society of Information Design. Search, P. (2014). Beyond Time: The aesthetics of interactive multimedia art and design. In A. Kozbelt (Ed. ), Proceedings of the International Association of Empirical Aesthetics. New York: International Association of Empirical Aesthetics (IAEA). Steen, L. (1988). Science of patterns. Science, 240 (4852), 611-616. Tuan, Y. (1997). Space and place: The perspective of experience. Minneapolis: University of Minnesota. West, T. (1991). In the mind’s eye. Buffalo, NY: Prometheus Books. Zabel, G. (2010). Theses on the art of virtual worlds. IVLA Selected Readings, 2014-15, first published on visualliteracytoday.org.